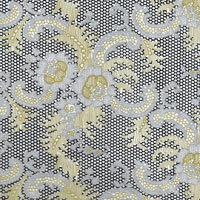 Lacy Design Black Silver and Gold Cellophane Roll 24 inches wide x 50 ft long. Very little of the design is without color so items will show through the design yet partly concealed. Cello background is clear.